Hello and welcome to the 199th instalment of the SWD. The Syrian Democratic Forces and its multiple groups continue to advance and clash against ISIS inside Raqqa city. 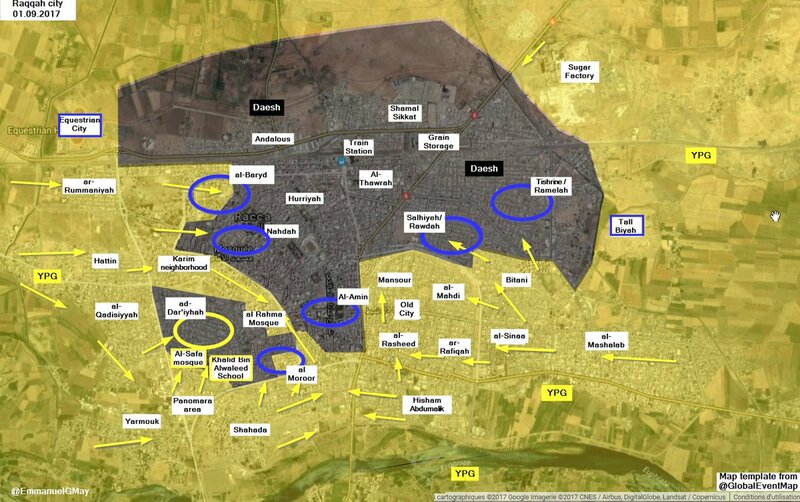 The SDF captured three main districts in Raqqa, the Old Raqqa city on the east; and Al-Diriyah and Tashih districts on the west part of the city. Even though, clashes continued between both groups near the Omar ibn Al-Khattab in Al-Busraia neighbourhood. At least 19 ISIS terrorists have been killed in different Raqqa districts. Despite today’s gains, fighting continues in six districts. One YPG video has been published today showing the degree of complexity and danger the ISIS-made tunnels pose to SDF fighters. The terrorist organisation had more than 3 years to build them, and, as mentioned in yesterday’s daily, they use the tunnels to launch surprise attacks. You can watch the aforementioned video here. One person was detained by the SDF counter-terrorism units “YAT” in Tabqa. The detained man tried to blow up a home-made bomb among the people celebrating Eid. The SAA unit “ISIS Hunters” captured Uqayribat from ISIS. This was considered the last major stronghold of the terrorist organisation in central Syria. Additionally, government forces captured Wadi Al-Azam and Huraysha, unconfirmed reports suggest that Rasm Al-Awabed may have been captured by SAA, too. Although, government forces did not enter all city areas since ISIS always leaves entire areas full of booby-traps, IEDs and mines before retreating. 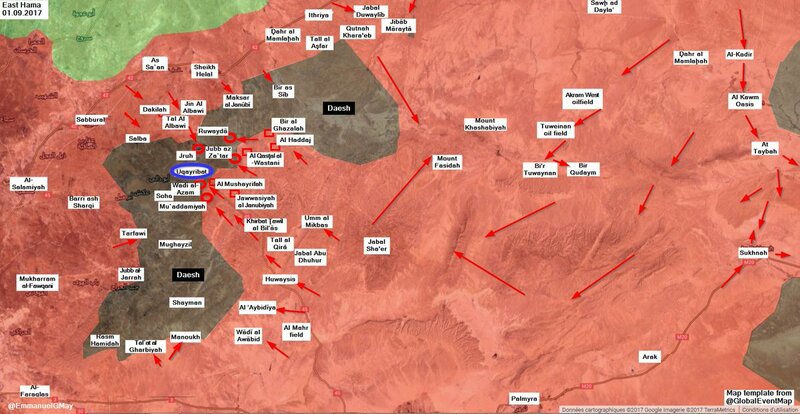 Syrian government army began to target Hamada Amar after defeating ISIS in Uqayribat. SAA captured large areas from ISIS inside the Hama-Homs pocket in central Syria. The captured area is located north of Manoukh and includes the village of Zakhrutiyah. Opposition sources reported massive shelling from government forces targeting Jobar and Ayn Tarma in East Ghouta pocket. The Syrian Arab Army and its allies pushed 3 km eastwards Al Bishri mountains, advancing towards Kobajjep from Sukhnah axis. On the 31st of August 2017, CJTF-OIR has conducted 22 strikes in Syria. CJTF-OIR‘s main focus in Syria is Raqqa region where they did 15 strikes supporting SDF‘s operations against IS destroying 10 fighting positions, three logistics nodes, two vehicles and a command and control node. Other areas where seven strikes occurred are Abu Kamal and Deir ez-Zor destroying 10 tactical vehicles, six fuel trucks, a vehicle, a machine gun, an ISIS tank, a staging area, and an oil still; damaged a bridge. The full report on CJTF-OIR strikes conducted in both Syria & Iraq can be found here.